Can you believe Christmas is around the corner? I can’t. I feel like I say that every year. While everyone is raking leaves and dreaming of Thanksgiving dinner, I got a jump on things and created this whimsical, eclectic Christmas tree. I really don’t know what I should call it! I was mostly inspired by our recent dining room turned family space makeover. 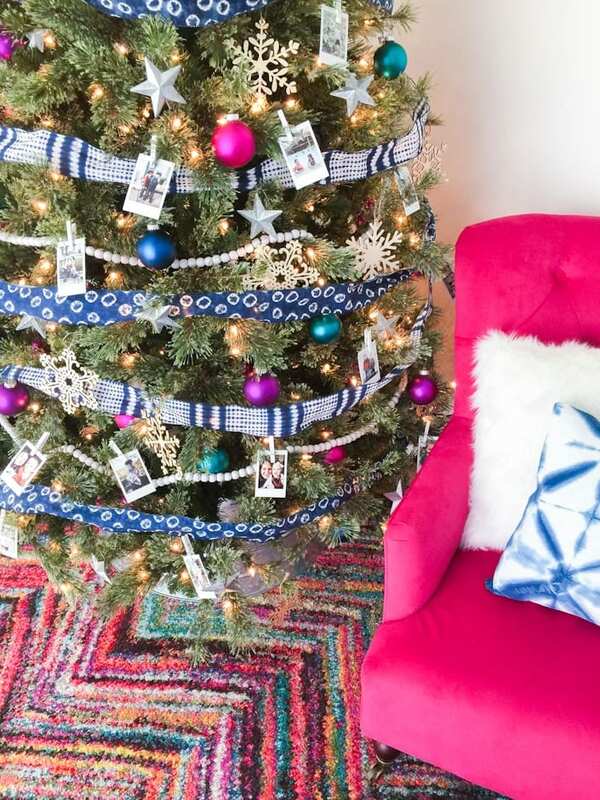 This happy colorful, room needed a happy, colorful tree! This is the second tree I’ve created as a part of the annual Michaels Makers #DreamTreeChallenge in partnership with Michaels Stores. They sent this gorgeous tree to our doorstep and I was asked to decorate the tree of my dreams. Like last year, I had a really hard time deciding on a theme, they had so many great things in store AND I wanted to make some of the elements. I like to simplify and use what I have when I can, so I included ideas you can DIY with items you have on hand. The tree itself is a 7.5 foot Jasper Cashmere Christmas tree, it is GORGEOUS in person. One nifty feature, as I connected each tree level, it lit up through plugs running through the center metal tree pole. 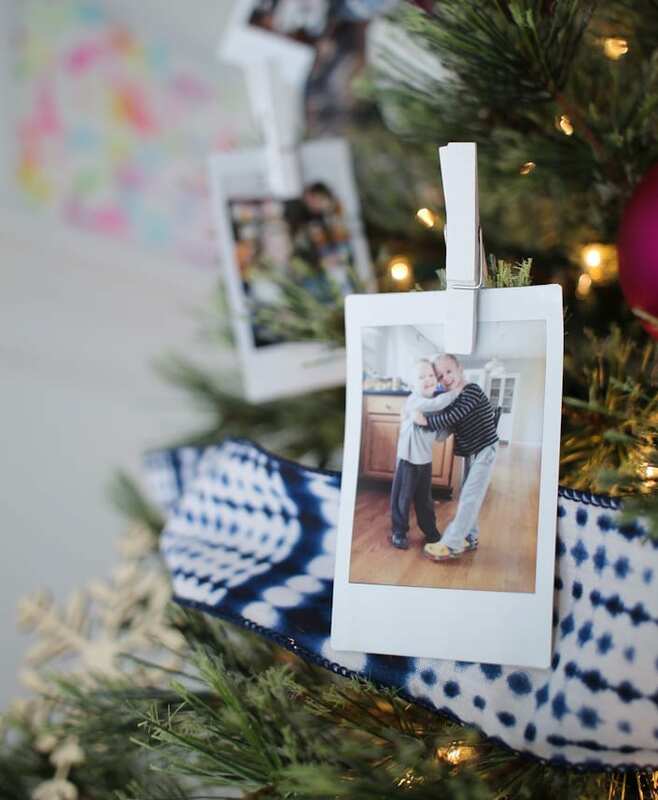 No plugging and fumbling through the tree or hiding cords. The I had a hard time deciding what to do for this tree, they had so many pretty things in store! 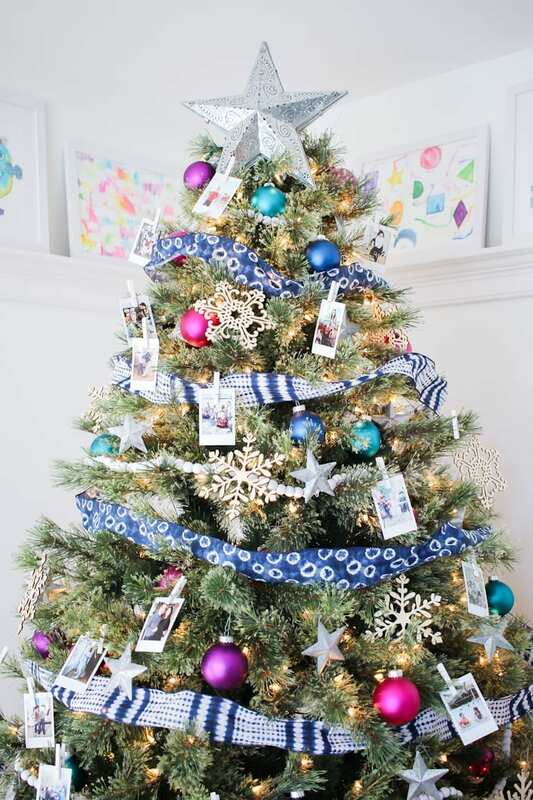 For last year’s rainbow pom pom tree, I added a ton of pictures printed from my Instax photo printer . It was my favorite part of the tree, friends and family would come over and linger around the tree. Our kids would look back at the pictures and we’d talk about the moments captured, the little stories I otherwise would have forgotten. 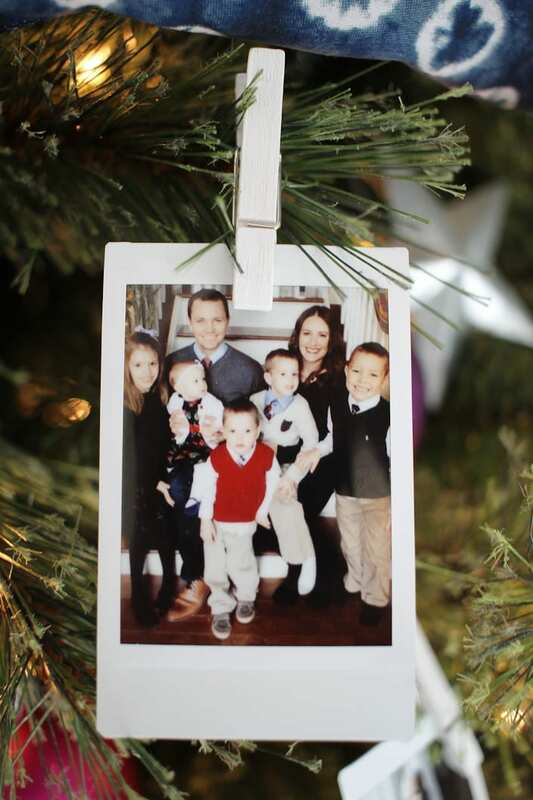 I decided to do the same thing for this tree, printing photos from throughout the year. 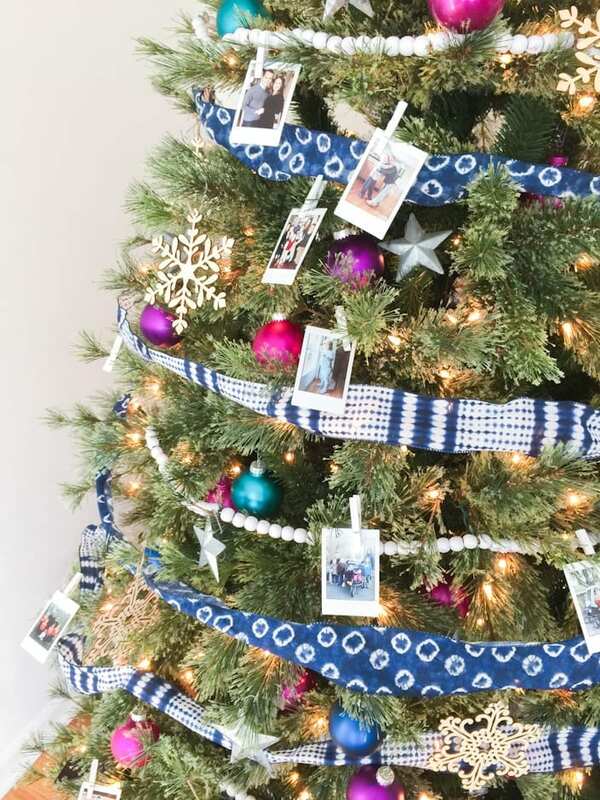 To turn them into ornaments, I simply clipped each photo onto the tree with these mini white clothespins. an, I’m starting to tear up looking at these, haha! 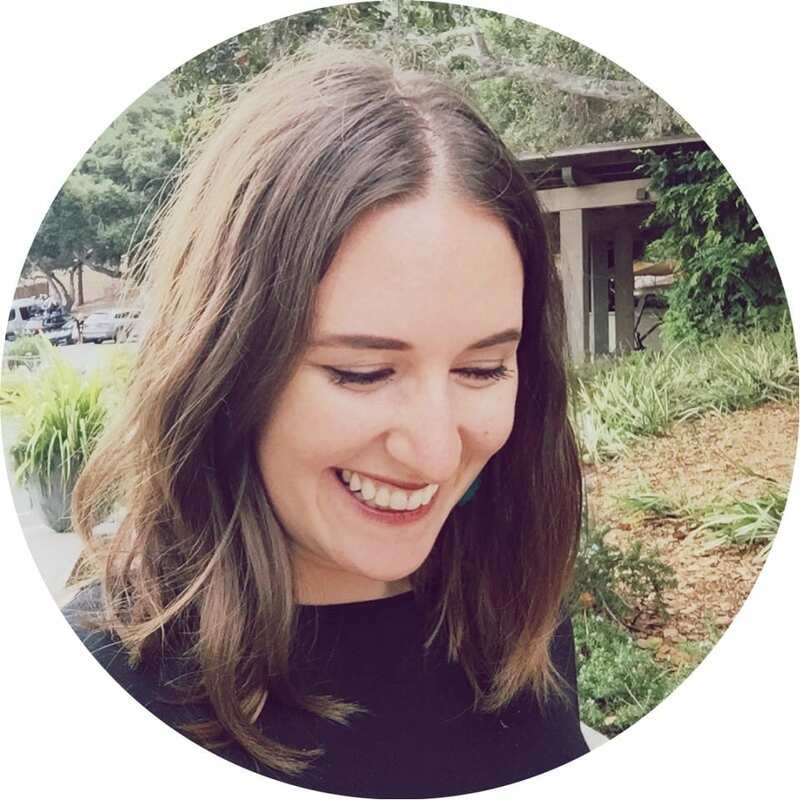 With each year, I tell myself “THIS year, this one has been the best.” Then the next year, “okay, I changed my mind, THIS is the best.” For all the good we’ve gone through this year, I feel like it’s also been one of the toughest, with lots of insecurities and anxieties the older they get. Soccer games (this picture cracks me up), an impromptu coffee/hot chocolate date selfie, my favorite big girl hugging my favorite little girl. I like adding a mixture of textures to my trees with different garlands. 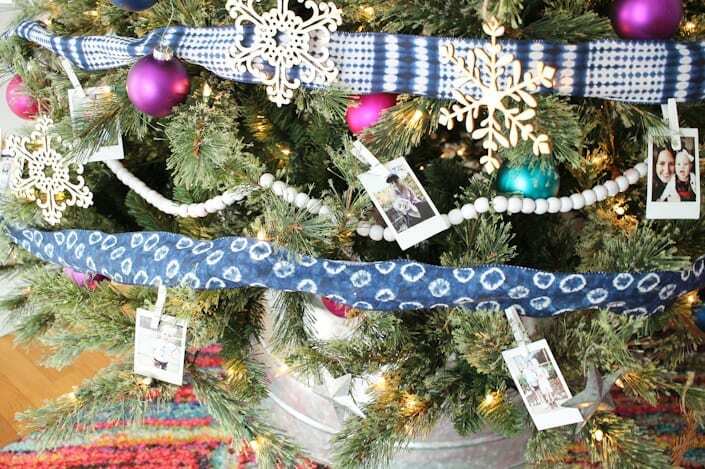 I saw the shibori tye-dye ribbon in store and I was sold, it was the inspiration for this tree. it reminded me of our DIY shibori curtains and pillow in the room. I alternated two different styles ribbon (3 spools for each pattern, 3 yards long). I found red, wooden beads and thought they’d add even more great texture. I spray painted them white so they wouldn’t compete with all the pink balls. I found the tin star tree topper in the holiday and outdoor lighting aisle. It has twinkle lights inside and isn’t an actual tree topper, so I used floral wire to fix it to the tree. 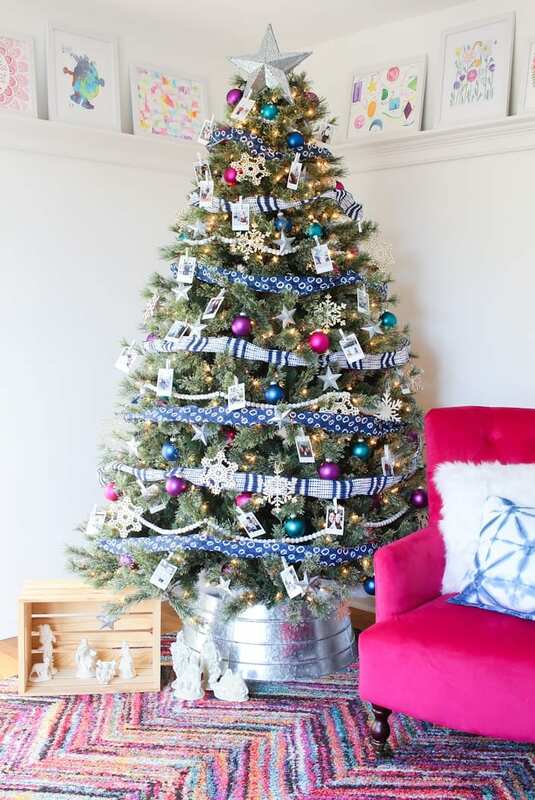 This galvanized metal tree skirt ties the whole thing together. A bit of buffalo snow fluffed into the bucket fills it out. 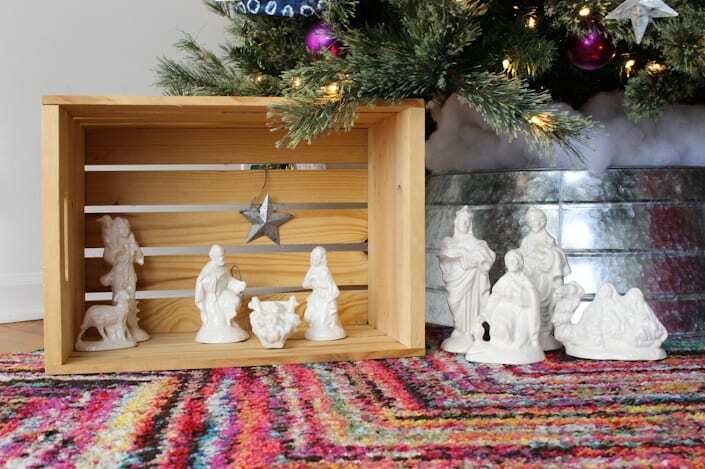 In years past I’ve put our nativity on a shelf and out of kid reach, this year I brought it down beneath the tree. I added an unfinished craft crate to act as a simple stable. 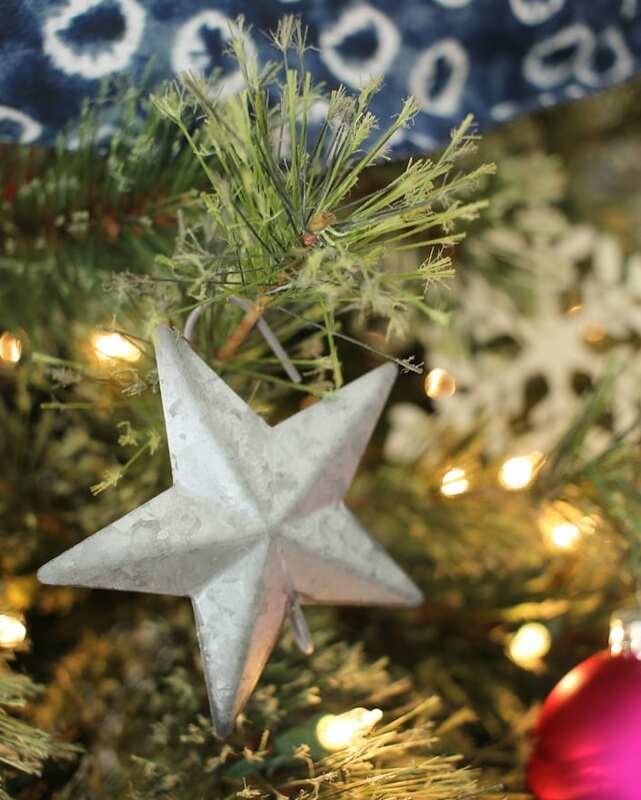 Those wise men needed a star or they’d get lost; I added one of the star ornaments from the tree. The rest of the tree is a mix of pretties. 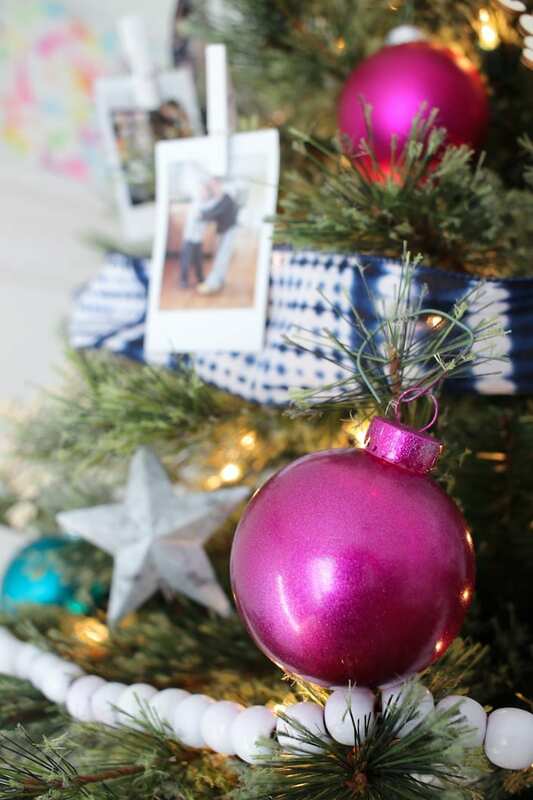 Pink, purple, turquoise, and turquoise glass balls add color to the tree and tie in with the room. I also spray painted a large tub of plastic ornaments this shimmer pink. Glass balls make me a bit nervous in a house with 5 kids. Especiall when two of those kids include an 18 month old who gets into everything and a 3 year old with a better arm than me. In the case that someone launches a glass ball of exploding shards, I will be moving the glass balls up higher and putting these all at the bottom. Or maybe I should do it now, juuuuuust in case. These tin star ornaments are meant to be small floral picks, I bent the pick back and formed it into a hook. 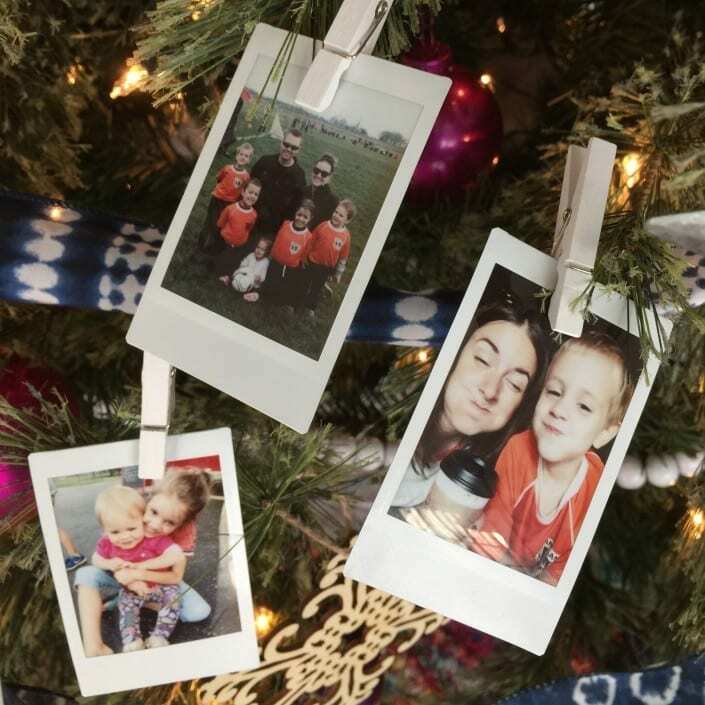 If you’re looking to create a big impact with many little ornaments all over, these were perfect and much more cost effective than regular ornaments. They ended up being .79 cents each, on sale and with coupons!! 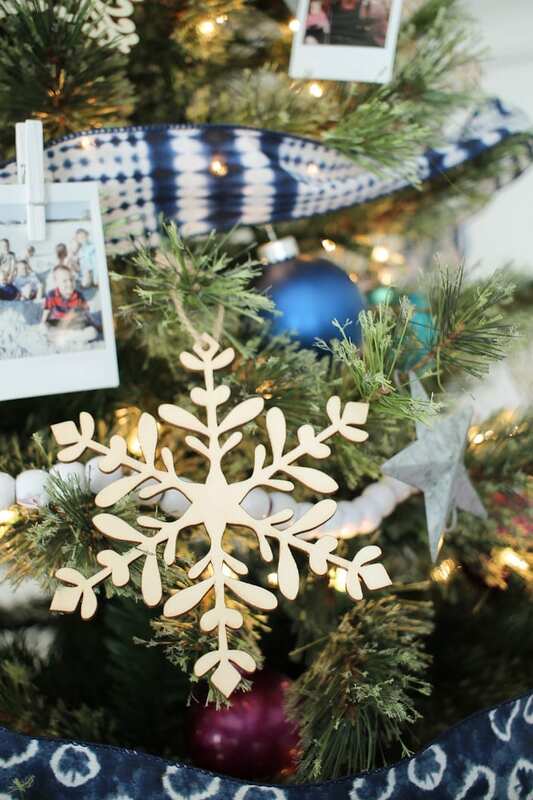 I really like the look of natural wood and added these wooden snowflakes all over the tree. They would be cute customized, or have kids paint them! The white fur pillow is also from Michaels, the no-sew tie-dye pillow was made using a blue tie-dye and a t-shirt. As if this room wasn’t cheerful enough before, this colorful, eclectic tree brightens up the space! I just had to comment on how your kids love to play with the nativity figures. We have the Fontanini plastic (aka resin) type. My boys loved our set so much that we called it the “Baby Jesus Action Figure Set” and talked about all his friends who came to visit (Ninja Turtles mostly). One year our dog chewed up the base of one of the Wise Men, so we always remember our long-gone Bailey when we put it out each year. Thanks for sharing! !